So how did the ‘expert on Islam’ do? Not so well…. 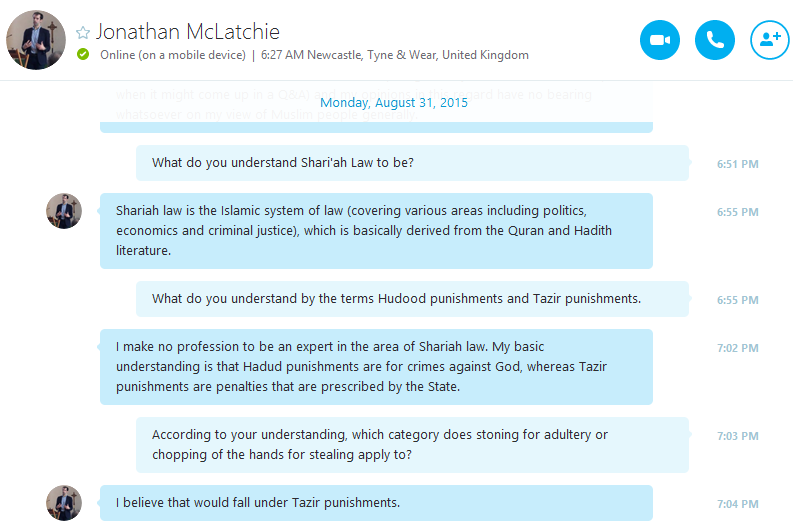 Shari’ah law, also includes what the English would refer to as “common law” and “civil law” with deep considerations taken of ‘Urf (العرف) – cultural norms and values. Shari’ah law, also includes the corpus of laws a Muslim would adhere to in his daily life: how do I pray, what is the Shari’ah ruling on food cooked in the same pot as pork or ham, what does the Shari’ah say regarding fasting if I’m traveling, etc. So not only does this ‘expert on Islam’, not know the basics, he relegated it only to crime, politics and economics. It was at this point I realised he did not know what he was talking about and I decided to ask him a very basic question regarding Shari’ah law. Immediately, he renounced his ‘expertise’, despite having advertised himself as such on Christian apologetics websites and on ABN/ Trinity TV’s shows last week. Jonathan was clearly caught off guard and quickly realised he needed to mitigate the situation, thereby relinquishing his claim to be an ‘expert’. This was a live interview, so he had no time to Google the answer, and he was live on Skype with me, I would have noticed if he was trying to Google search the answer to my question. So caught between a rock and a hard place, the ‘expert’ then, ‘not an expert’, who returned to being an ‘expert’ last week did indeed get the question wrong. The Hadd laws, refer to very specific punishments within the Shari’ah. This would include stoning and cutting of the hands, which do require in and of themselves, very specific evidences for the punishment to be meted out (which is difficult to attain in most cases). These are not Ta’zir laws, which are discretionary judgments by an Islamic judge (qadhi). So the well advertised and self-proclaimed ‘expert’ on Islam needs to publicly correct himself. His rabid tirades against the Islamic Shari’ah, when he clearly does not understand it are very worrisome. He’s arguing and hating against something of which he has no idea about. Clearly then, when confronted with a difficult situation, he quickly discarded his ‘expert’ title and rightfully accepted his position as being theological unqualified about Islam. I advise Jonathan, to fully discard the title, you sir are not an ‘expert on Islam’.